Finally I braved the harsh August summer elements and trekked out to the garden shed to lay the brick floor down. I didn't get finished but I did manage to get some important work done like leveling the crushed gravel underneath where the bricks will go. I took a board and a level and made sure that the gravel was nice and even underneath. 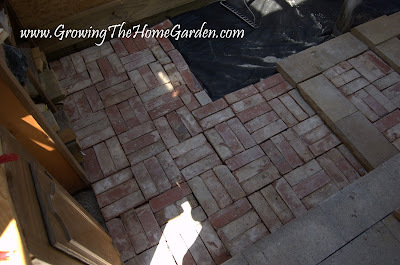 The bricks are going in the garden shed in three sections: a back area, a step/landing, and the front area. The step/landing is a transitional spot that helped bridge two different levels in the greenhouse grading. I went with a basket weave pattern that didn't require any cutting of bricks. 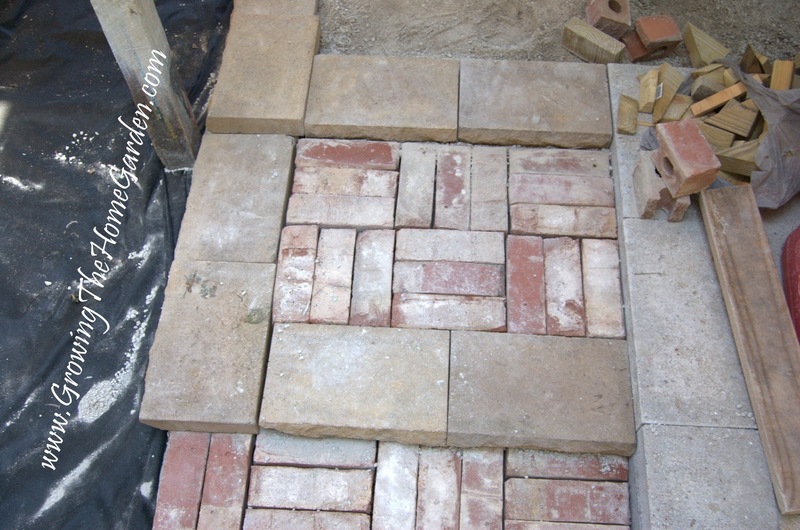 I installed a patio a couple years ago and had to cut a few of the paving stones - it's not fun without the right equipment! On the right side of the picture are two layers of bricks that haven't been properly set yet. For now they are just holding down the black landscape fabric. Here's a better look at the brick floor. To the right is the step landing which is only about two feet deep by two and a half feet wide. And here is a closer look at that step. The large stones were a part of my Arbor project for Better Homes and Gardens last year. They weren't very effective as stepping stones so I moved them to use here in the garden shed. I only managed to cover about a third of the shed with bricks so far. By 11:15 this morning the temperature in the shed reached 104 F. Too hot to work. Fortunately the shed stayed in the shade up until then which made working there hot but not excruciatingly uncomfortable! A solid floor for walking. Porus for water to flow through. Works as a heat sink. It looks great Dave. This heat is not really bothering me-it's the dryness that I'm stressed about. Need some rain! Dave, once again you are doing a wonderful job. I love how you put tips/advantages and or disadvantages in the little box at the end of your posts, nice touch. Thanks Tina! It looks like we got a drop or two of rain. Not nearly enough. I definitely hope more is one the way. Thanks Darla! I'm glad you liked the tips part. Oooh, I love the brick floor! That's an awesome idea. Thanks for leaving a note on my blog. I really love your garden shed. It's awesome! 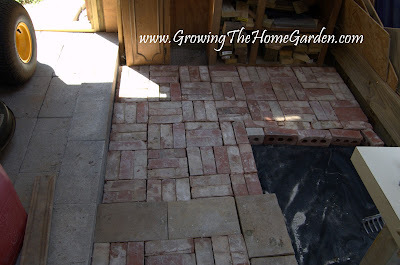 I love that you are using reclaimed brick for your floor. How did you get so many bricks. I want to do that for our project as well. I've been scouring the boards of Craigslist to find bricks! These were all free - some from my neighbors but most from a single Craigslist poster. They are very hard to find for free though but since you are planning ahead start searching and collecting anything you might want to use for your shed.